The M113 APC had served the US Army well before the appearance of the Russian BMP-1, an Infantry Fighting Vehicle, which offered great protection and offensive capabilities than any APC in US service. The M113A1 had entered production in 1964 and was used in the late 60’s as the basis for an improved vehicle. The US Army then decided to go with the more heavily armoured and more capable Bradley IFV also developed by FMC, who had manufactured the M113, but was heavily exported. The improved vehicle saw the addition of module armour on the front (box) and sides (identified by rounded edges with bolts), which was bolted on to the existing aluminium armour frame of the M113. A undesignated laminate armour was then inserted in to these modules. A new, one man turret was installed, which housed a KBA 25mm auto cannon and a coaxial 7.62mm MG. The 25mm could be elevated from -10 to +50 degree’s and the turret could traverse a full 360. The vehicle can store 324 x 25mm rounds and 1840 x 7.62mm. The vehicle has a bank of 6 smoke grenade launchers. It can also be fitted with an NBC system. The vehicle has a 3 man crew. The driver sits front left, the commander behind him. The gunner is located in the turret, which is right of the commander. The turret has and can be replaced with a shielded .50cal firing station. The vehicle which carries 7 equipped troops, is powered by a Detroit Diesel 6V-53T V-6 liquid cooled diesel, generating 264bhp. This is an improved engine of the original used in the M113 series and is located front right of the driver. The vehicle is fully amphibious. The basic model features as stated above are those, which were configured to the requirements of the Dutch Army and was designated the YPR-765 and went on to serve as the international model. The Netherlands was the first nation to step up and purchase the vehicle under the designation YPR-765. AKA the Dutch Army, they initially ordered 880 in 1975, but went on to licence build the vehicle and the final number delivered was 2079. YPR-765 PRI – basic IFV vehicle with 25mm KBA cannon. YPR-765 PRCO-B – command vehicle with a crew of nine and fitted with the same turret as the PRI. YPR-765 PRCO-C – command vehicle with .50cal cupola. YPR-765 PRCO-C1 – Battalion commanders vehicle. YPR-765 PRCO-C2 – Battalion fire control centre. YPR-765 PRCO-C3 – Mortar fire control vehicle. YPR-765 PRCO-C4 – Anti-aircraft command vehicle. YPR-765 PRCO-C5 – Observation vehicle for artillery units. YPR-765 PRRDR – Radar vehicle fitted with a ZB-298 battlefield surveillance radar. Withdrawn. YPR-765 PRRDR-C – Radar command vehicle. Withdrawn. YPR-765 PRI.50 – APC with .50cal cupola. YPR-765 PRMR – Tractor for 120mm mortar MO-120-RT with cupola mounted 12.7mm M2 machine gun. YPR-765 PRVR – Cargo vehicle with cupola mounted 12.7mm M2 machine gun. YPR-765 PRAT – Fitted with a TOW missile launcher as, entered service in 1982. 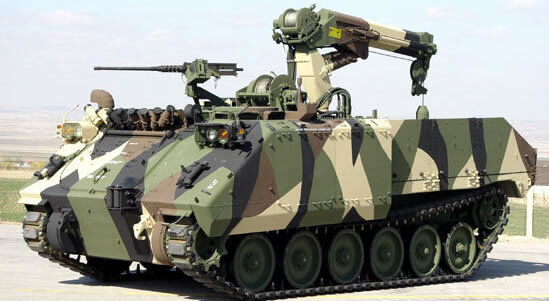 YPR-806 PRBRG – Armoured recovery vehicle, in fact based on a modified M113A1-B chassis and hull. The vehicle is gradually being replaced with the continued delivery of Swedish BAE CV90’s and has gone on to sell surplus vehicles to other nations. The Belgian Army licence built from 1979, 514 vehicles under the designation AIFV-B. AIFV-B – NBC system and Halon fire suppression system. AIFV-B-C25 single man turret with 25 mm KBA cannon with smoke grenade launchers fitted. AIFV-B-.50 .50cal cupola, 2x 71mm mortars and pintle mount for Milan ATGM. AIFV-B-CP – command post vehicle .50cal cupola. AIFV-B-TRG – driver training vehicle. This vehicle is gradually being replaced with the Piranha IIIC 8×8 wheeled IFV and have been selling the vehicle on to other countries. Turkey has been a prolific manufacturer and future developer of the vehicle, under the designation ACV. Turkish firm FNSS not only licence built the series, but went on to develop a second vehicle, which has also been a great success. Not all variants of all three models are included as its an inexhaustible list and come in multiple roles. 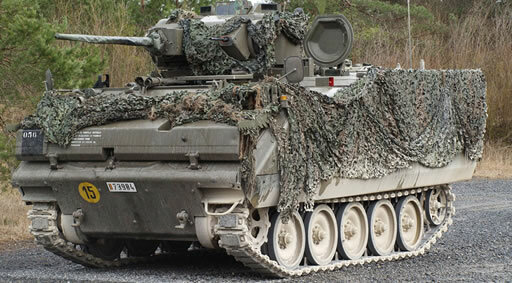 ACV-IFV – this is the ACV-300 troop carrier with FNSS’s Sharpshooter Turret, which uses a 25mm Bushmaster chain gun. ACV HMTS – ACV-300 armed with four Hellfire missiles in the ready to fire position. 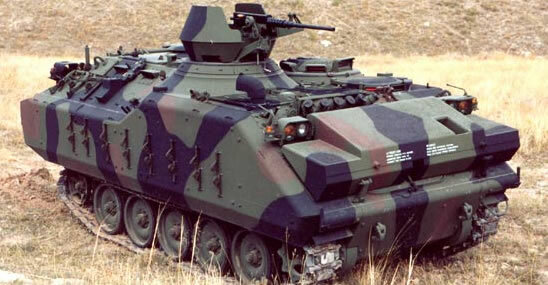 120mm AMV – A private venture, armed with a TDA 120mm recoiling mortar in the rear of the vehicle. Not in service. ACV-350 – Fitted with a 350 hp powerpack. This vehicle is the most modern variant and a stretched ACV-300. The torsion bar suspension has been upgraded and a new 350hp Detroit diesel with an Allison fully automatic transmission. Its fitted with air-conditioning and an over-pressure NBC system. The vehicle can be adapted for other roles. In 2007, Janes reported a Middle East country had purchased this vehicle in a command post vehicles. Malaysia has licence built (Malaysian company DRB-Hicom Defence Technologies) a modified series of ACV-300, designated the Adnan. These include .50cal turrets and 25mm Bushmaster chain gun turrets, ambulances, command, signals, mortar carrier, Anti-Tank GM carriers and armoured recovery vehicles. Its believed that they will be further purchasing some ACV-S.
Philippines – followed after the Netherlands with an order of 80+ vehicles equipped with the KBA 25mm auto cannon and Armoured Recovery Vehicles in 1979. 6 Turkish ACV-300’s were purchased in 2009 (see below Turkish vehicle entry). The United Arab Emirates – have 136 ACV-300 in service. Bahrain – operate 25 ex YPR-765, which were delivered in 1996 and 42 ex AIFV-B-C25. Chile – operate 25 ex YPR-765s and 169 ex AIFV-Bs. Egypt – operate 1207 ex YPR-765s. Lebanon – operate 16 ex AIFV-B-C25.